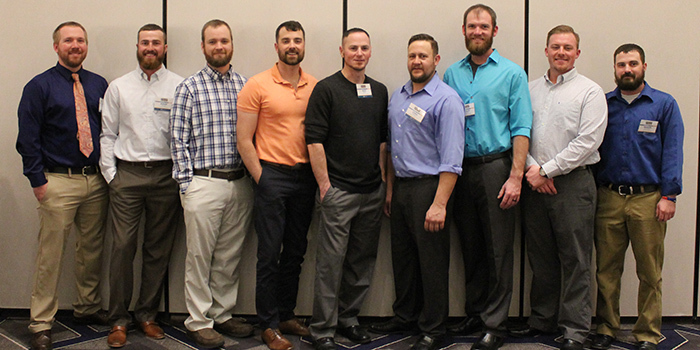 Pictured, from left, are Vance Stwalley, Warren County REMC; Adam House, Heartland REMC; Nicholas Barker, Tipmont REMC; Troy Burton, Newton County REMC; Jesse Webb, Kankakee Valley REMC; Chris Frank, Kankakee Valley REMC; Tyson Jones, Carroll White REMC; Matthew Huck, NineStar Connect; Mason Quickery, Jay County REMC. KOSCIUSKO — A Kosciusko County man is one of 12 lineworkers to graduate from Indiana Electric Cooperatives’ apprenticeship program, Rural Electric Apprentice Program. REAP is a four-year program that professionally trains apprentice lineworkers from across Indiana. Graduates complete 576 hours of classroom-related study and 8,000 hours of on-the-job training at their electric cooperative. Students also complete four additional classes through Ivy Tech Community College. Upon completion of the program, graduates earn an Associate’s Degree of applied science and a journeyman lineman certificate.